Multinational and public sector banks have their strengths. A veteran of both systems finds a new challenge. When Romesh Sobti took over as IndusInd Bank’s Managing Director & CEO in early 2008, the timing and circumstances were perfect: The stock market had just tanked and the bank was an organisational jumble. At branches, the tellers were upfront and customer care at the back. Within, there was no clarity on client or product segments. The global financial meltdown was months away, but what Sobti began doing almost immediately after joining would keep IndusInd steady when the slowdown hit. Sobti revamped the branches, got people to cross-sell and worked out a three-year business plan. IndusInd was already reshaping itself for tough times. “We adopted a theme of productivity, profitability and efficiency,” says the 59-year-old Sobti, who has over three decades in public sector and multinational banks (his last job was at ABN AMRO India, now part of Royal Bank of Scotland, at which he rose from a Chief Manager to the Country Executive’s post over 18 years). IndusInd brought in more lowcost deposits and pared its nonperforming assets. The result: Profits improved sharply. On the qualitative front, the stock market started giving a higher PE (price to earnings) to IndusInd Bank once Sobti joined the bank and brought in other top notch professionals. And, as the BT rankings show, IndusInd improved its rankings by market cap from #203 in 2008 to #148 in 2009. On the quantitative side, the bank significantly improved its asset quality and risk management capabilities and used the technology platform to deepen its customer relationships. “Banking remains the same, it’s only the approach to customers that changes,” says Sobti. At IndusInd, Sobti could not fall back on the large network of a public sector bank or the global strength of a foreign one. But this had its advantages. “You don’t have to go to Amsterdam or Singapore for approvals,” laughs Sobti. Today, IndusInd is one of the fastest-growing banks in India (in 2008-09, its net profit was almost double the previous year’s figure; in the first half of the current fiscal, net profit is up 200 per cent, year-on-year). Sobti recruited big and poached talent with a performance-based culture. It helped that the job market had softened considerably. And who were these people at the senior levels? Top-notch foreign banking professionals with decades of experience in banks like ABN AMRO, ANZ Grindlays (now Standard Chartered ), Citibank, Bank of America as part of top management team. Also, half the new workforce came in last year. The new initiatives were supported by a new brand campaign— “Makes you feel richer”—which repositioned IndusInd as a tech-savvy bank for the smart and energetic young people. While repositioning its retail products like home loans, auto loans and remittances, IndusInd Bank introduced new ones like cash management, structured trade finance and supply chain financing. Even as he launched new products, Sobti mobilised Rs 480 crore from institutional investors to strengthen IndusInd’s capital base. The capital adequacy of over 15 per cent now offers enough headroom for the bank to be aggressive in corporate and retail lending. The net interest margin jumped from 1.53 per cent in FY08 to 2.86 per cent in Q2 of FY10. The bank does not make any forward-looking statements, but research houses reckon IndusInd will improve its net interest margin—a key profitability parameter—from 1.9 per cent in FY09 to 2.8 per cent in FY11. Similarly, the return on assets would go up from 0.6 per cent to 1 per cent and return on net worth will jump from 9.8 per cent to 15.5 per cent by FY11. In the second quarter of the current financial, IndusInd reported a 131-per cent increase in profit after tax, possibly the highest for any private sector bank. This continued the trend it set in the first quarter ended June 30 with a 352 per cent net profit jump, when it beat biggies like ICICI Bank and HDFC Bank. The nearest that a bank had come to IndusInd was the southbased Federal Bank, which reported a 100 per cent jump in its net profits, followed by YES Bank, with an 85 per cent rise. “Things are bouncing back much faster than we thought,” says Sobti, just before the Q2 results were announced. 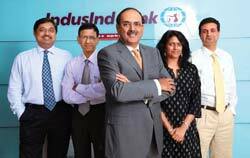 His goal is clear: Make IndusInd one of the top three private banks in productivity, profitability and efficiency.